While some will I’m sure object to the quote in the cartoon above, I will argue that the quote itself is reflected in much of the Book of Mormon, as well as in LDS history, though not always in the way one would think. FIrst, the easy part. The message that “death is not the worst of evils” pervades the Book of Mormon. A long series of prophets, starting with Lehi, risk their lives in order to deliver God’s word; some, such as Abinadi, die unpleasant deaths as a result. Likewise, believers risk — and in some cases lose — their lives for their beliefs. The women and children converted by Alma2 and Amulek in Ammonihah are thrown alive into a pit of fire; Alma2 notes that “the Lord receiveth them up unto himself, in glory.” (Alma 14:8-14). The people of Anti-Nephi-Lehi allows themselves to be killed rather than take up weapons or renounce their faith; “and we know that they are blessed, for they have gone to dwell with their God. . . . Therefore, we have no reason to doubt but they were saved.” (Alma 24:20-26). The Book of Mormon also notes the tragedy of those who die unprepared to meet God (Alma 48:23), and several of the prophetic discourses in the Book of Mormon (notably Jacob and Alma2 ) stress the importance of being prepared to meet God (via death) at all times. Second, I would argue that the sentiment “Live free or die” is reflected through much of the Book of Mormon as well, as well as in LDS history, though with perhaps at times with a different meaning than usually suggested by that phrase. But, as I have said, in the latter end of the nineteenth year, yea, notwithstanding their peace amongst themselves, they were compelled reluctantly to contend with their brethren, the Lamanites. Yea, and in fine, their wars never did cease for the space of many years with the Lamanites, notwithstanding their much reluctance. Now, they were sorry to take up arms against the Lamanites, because they did not delight in the shedding of blood; yea, and this was not all—they were sorry to be the means of sending so many of their brethren out of this world into an eternal world, unprepared to meet their God. Still, this same book of Alma tells of the people of Anti-Nephi-Lehi, who were perhaps the most righteous people in all of Book of Mormon history — who willingly died rather than take up their swords against their fellow Lamanites. This they did rather than violate their covenant with God that they would never take up weapons of war again, because of their previous “sins and many murders”, swearing that “rather than shed the blood of their brethren they would give up their own lives” and that they “would suffer unto death rather than commit sin.” (Alma 24:6-19). Likewise, with rare (and usually unproductive) exceptions, the Latter-day Saints chose to move along — from New York to Ohio to Missouri to Illinois to the Rocky Mountains, with resultant hardship and death — so that they might live free to practice their religion. While the Doctrine & Covenants does contain the “Lord’s law of battle” — which justifies battle only after three efforts at peaceful settlement have been rejected (cf. D&C 98:34-38) — the few instances of armed resistance by Latter-day Saints usually just made things worse. Therefore what say ye, my sons, will ye go against them to battle? And now I say unto you, my beloved brother Moroni, that never had I seen so great courage, nay, not amongst all the Nephites. For as I had ever called them my sons (for they were all of them very young) even so they said unto me: Father, behold our God is with us, and he will not suffer that we should fall; then let us go forth; we would not slay our brethren if they would let us alone; therefore let us go, lest they should overpower the army of Antipus. 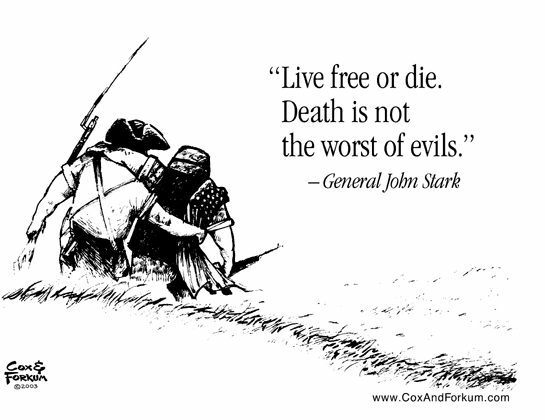 “Live free or die” is literally the choice before us, while “Death is not the worst of evils” is a reminder of what really matters in our mortal — and eternal — lives. There are causes worth dying for, and there are outcomes to our choices that are worse than death. Both things worth keeping in mind. ..bruce..